Like the British, the French left their mark on Africa in a variety of ways. One of the most benevolent was the railways. From Morocco’s ancient capital Fes, the journey to Marrakech in the south west is a long one which ever way you take it. The train is definitely one of the less stressful. It is good train country, much like the sun-baked plains of Spain across the Mediterranean to the north. The track winds past plateaus and rocky hills and vast flat plains. The scenery is dry and endless, broken by the occasional town and greenery. Occasionally a village will appear by the window, flashing past as the train rumbles in its way. 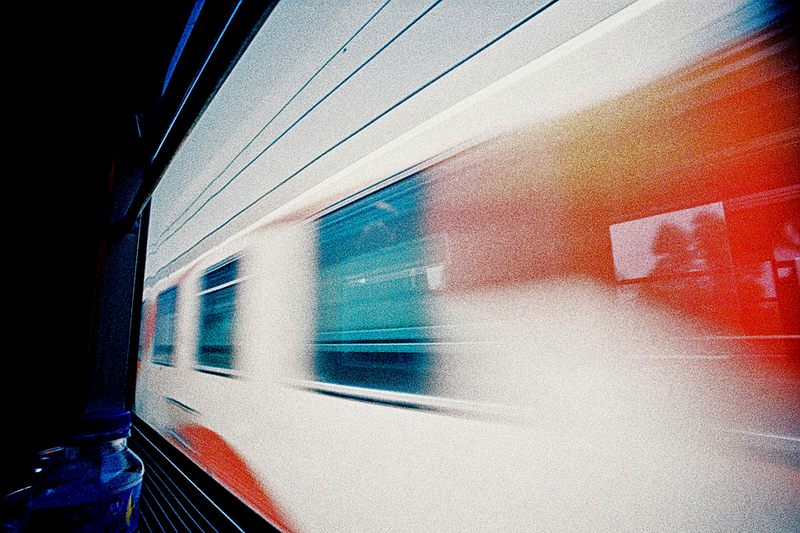 Lomos are great cameras for capturing train travel. I burned through a bunch of rolls on my Lomo LC-A when I did the Trans-Siberian in 2004, capturing the endless blue of the Siberian sky and the vast forests and stepped sweeping past. The LC-Wide, with its 17mm lens, captures even more of the scenery. This shot was taken as another train passed us heading north. The unreal cross processed colours – this was shot on old Agfa CT100 Precisa – help convey the speed. One of the lovely things about cross-processing slide, apart from those larger-than-life colours, is the extra grain that’s produced. It really does add bags of atmosphere. This train was gone in a flash, and I was lucky to get this blink-and-you’ll-miss-it moment. In an instant, the emptiness returned.